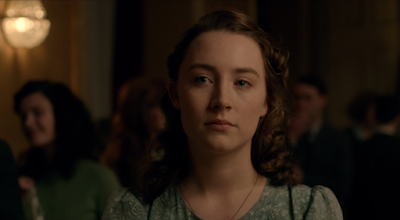 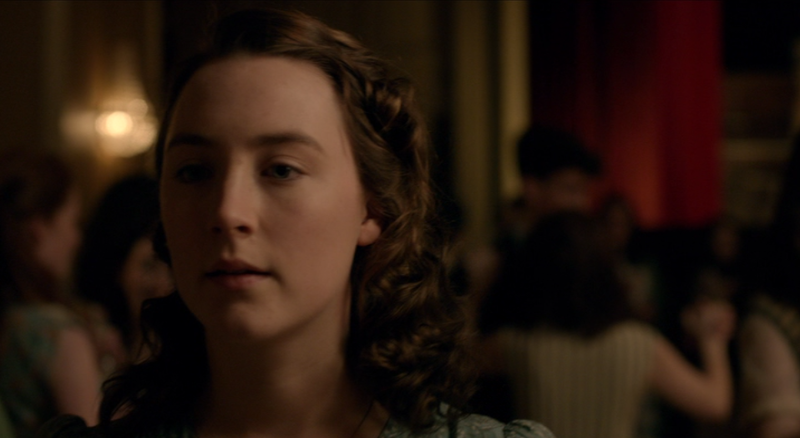 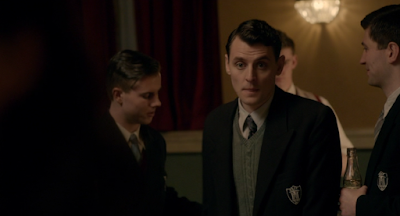 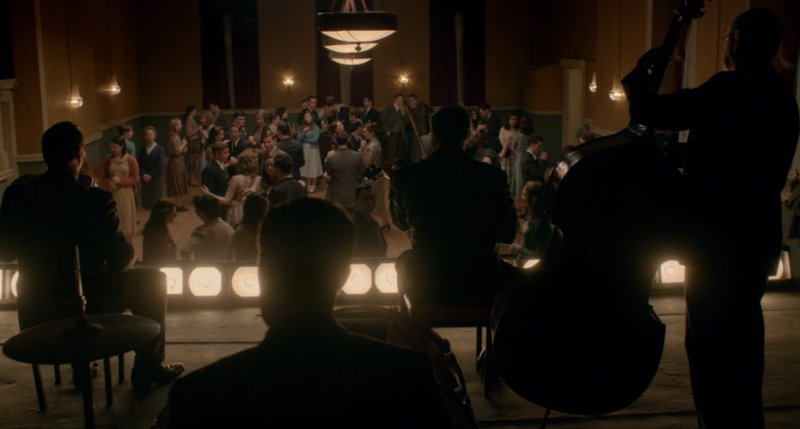 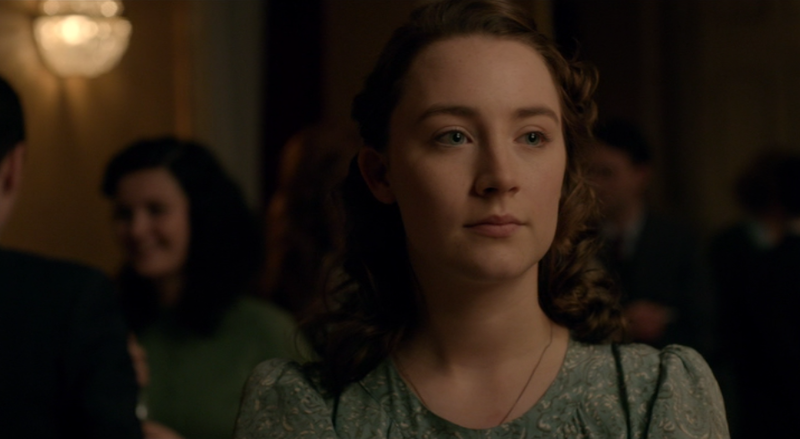 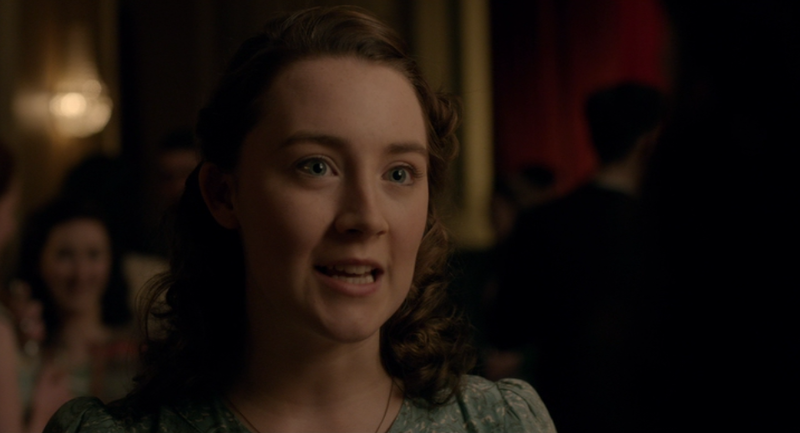 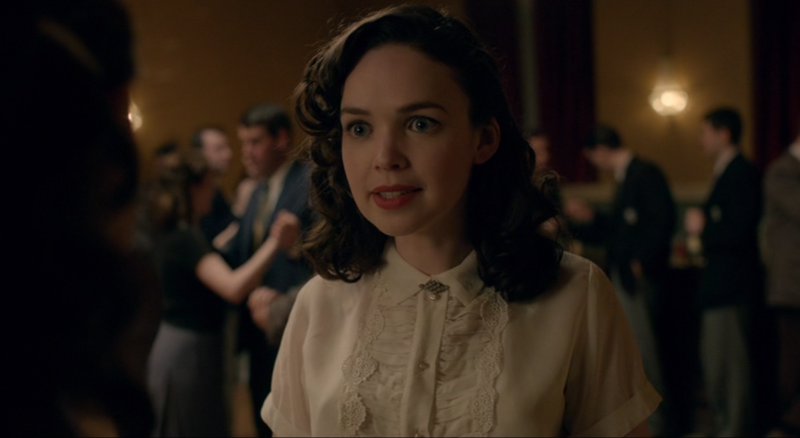 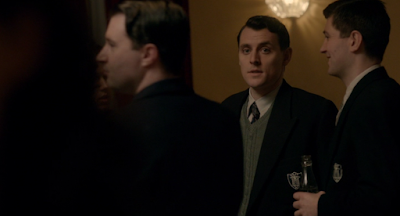 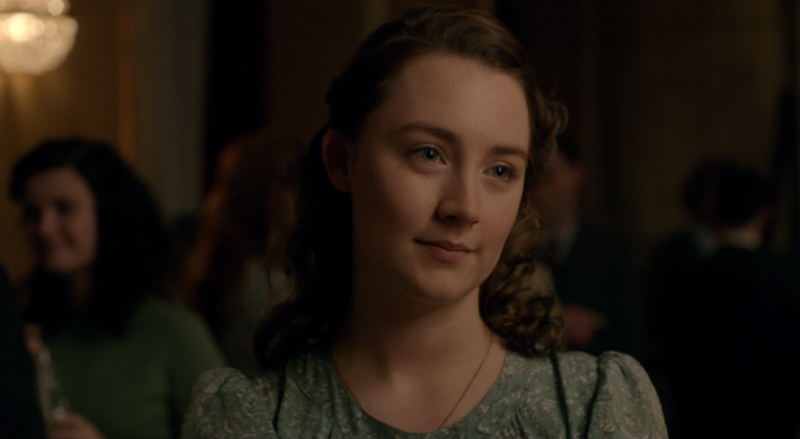 I mostly, not completely, liked “Brooklyn”, John Crowley’s 2015 film, though you can read about my misgivings elsewhere because I am here today specifically to discuss a sequence I adored. 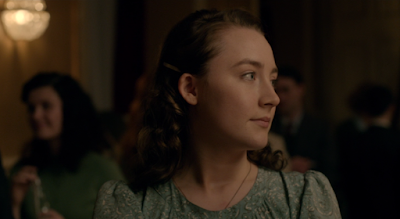 It is early in the film, right after Eilis (Saoirse Ronan), living in a small village in Ireland in 1951, has announced she will leave her native country for America — namely, Brooklyn. In the lead-up to this, she attends a local dance with her best friend Nancy (Eileen O’Higgins) who is hoping to see George (Peter Campion). 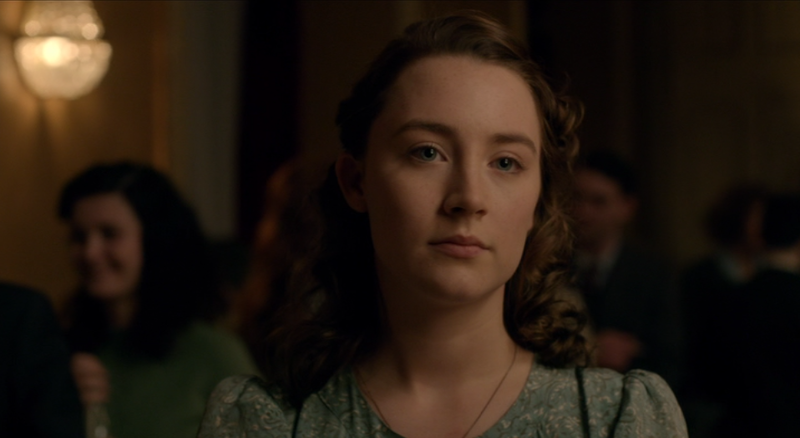 And the subsequent scene becomes an evocative of illustration of how the best moments in “Brooklyn” repeatedly take place not so much in the titular locale as on the face of its indelible lead actress. 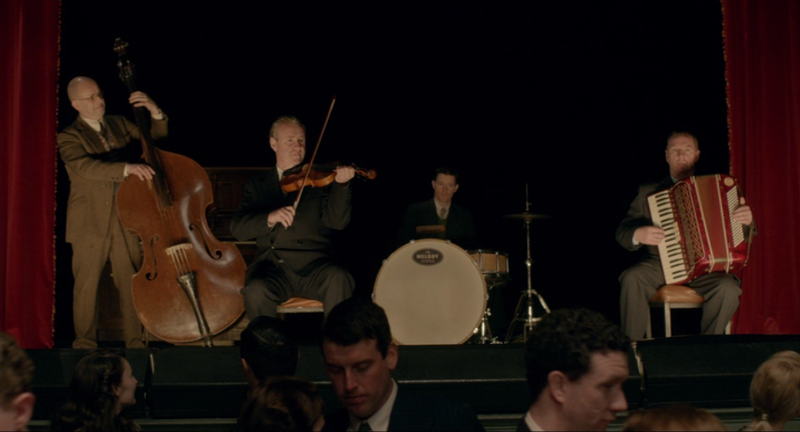 Crowley establishes the scene with a shot of the band, underscoring how music will be the scene’s backdrop. Then Crowley switches to a wide shot of the dance itself, establishing both location and situation. 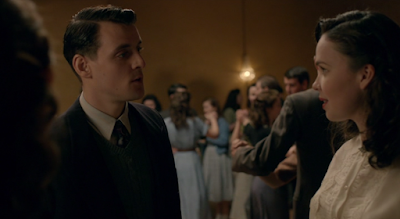 Here is George, on the edge of the dance floor, taking a drag on his cigarette and checking out Nancy, thinking about asking her to dance. And here is Nancy, wondering if George, seen there over her shoulder in a deep frame, is checking her out and wondering if he is wondering if he should ask her to dance. 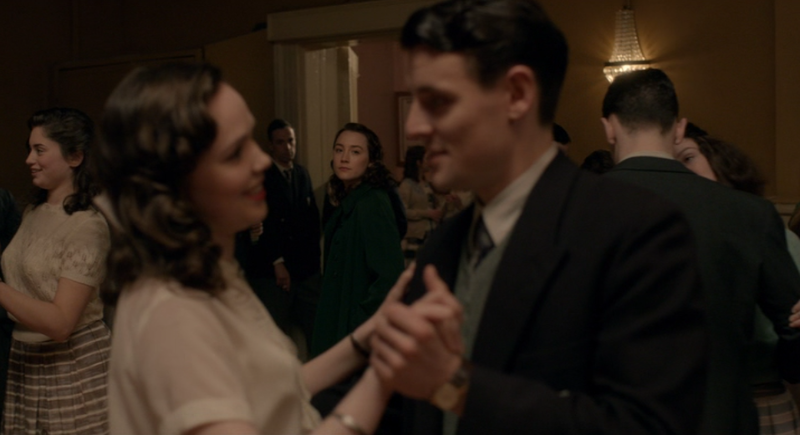 And here is Eilis, checking and confirming for Nancy that George is checking her out and probably thinking about asking her dance. And notice how in the shots of Eilis the background characters are not afforded quite as much weight as in the shots of Nancy. 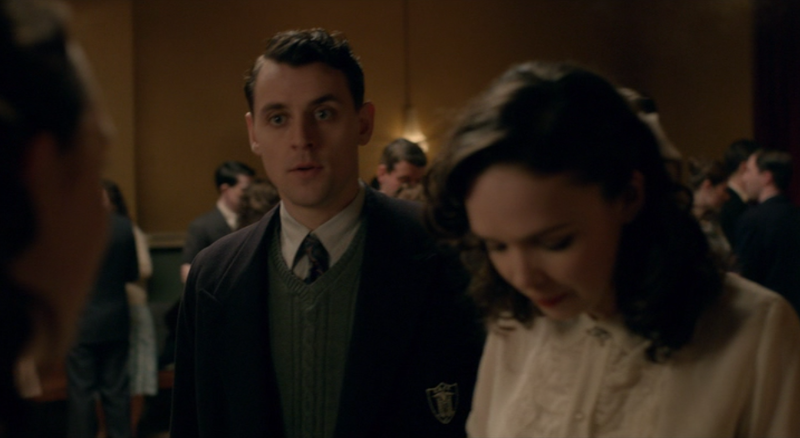 Now George notices that they notice that he is checking Nancy out. And now here is Eilis relaying to Nancy that he notices that they notice that he is checking Nancy out. ...which gets on the nerves of Eilis. And this whole sequence, as they frames demonstrate, are cut for maximum comic effect, and that effect is ably sold by Ronan’s performance, a performance in which she toggles so effortlessly from humorous to heartfelt to places in-between throughout. 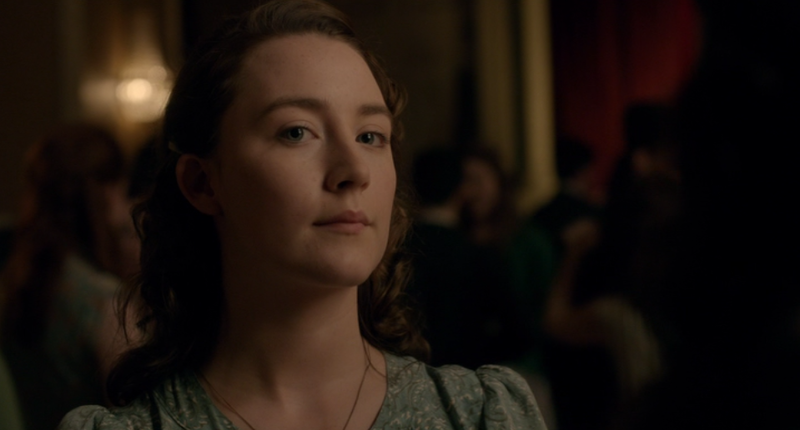 I like that upon George’s arrival he first looks to Eilis, almost as if she has assumed a motherly position and he wants to non-verbally communicate good intentions. But now, as if getting getting the implied permission of Eilis, he turns to Nancy and asks her to dance. And the movie allows Eilis her own reaction to this moment, which is not one of jealousy but joy for her friend. 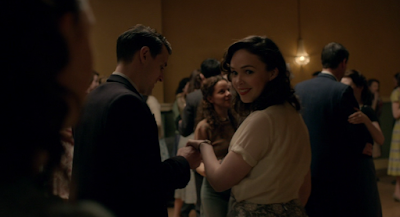 And her friend reciprocates as George leads her to the dance floor. 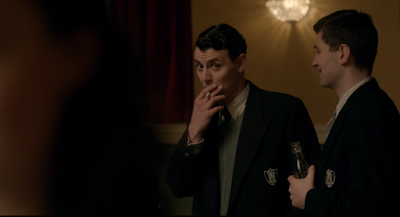 And this...this is where Ronan takes over. In the enusing frame, which Crowley simply holds to allow Ronan to fill it and own it, every movement her eyes make, every movement her face makes, every movement her head makes, quietly, simply conveys exactly what her character is thinking. 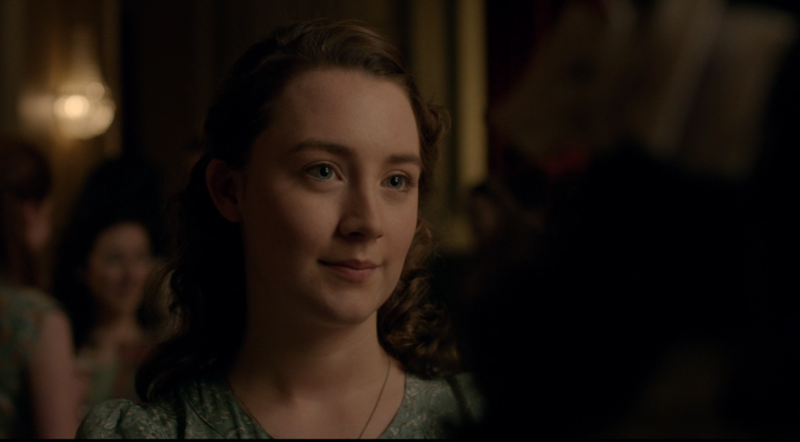 First, Ronan lets the pure joy dissolve into something more like wistfulness, not for her friend, of course, but for herself, for how all of this is something she is about to leave behind. 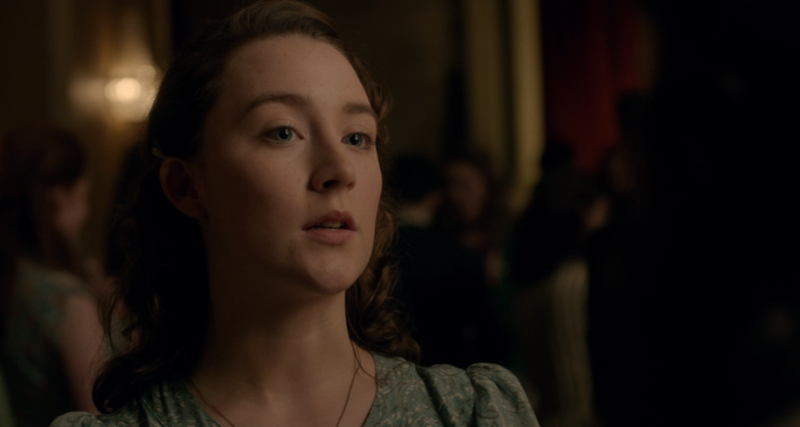 And as if grasping she is about to leave all this behind, she turns toward everyone and everything else, to let it all wash over, scanning the whole room, bit-by-bit, before her eyes tilt to the left and toward the door. 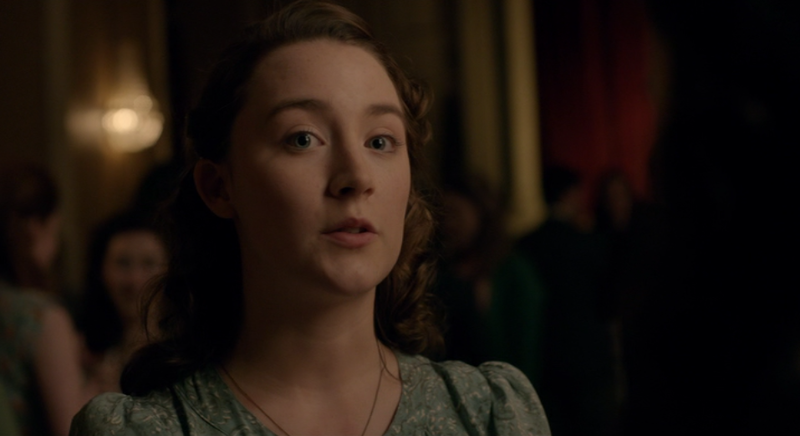 ...and purposely strides toward the door. 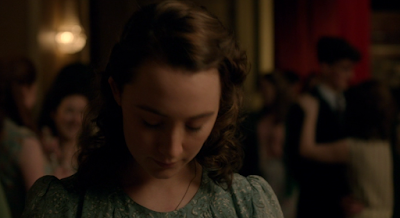 Crowley cuts back to Nancy and George in the midst of their dance, lost unto their burgeoning love. 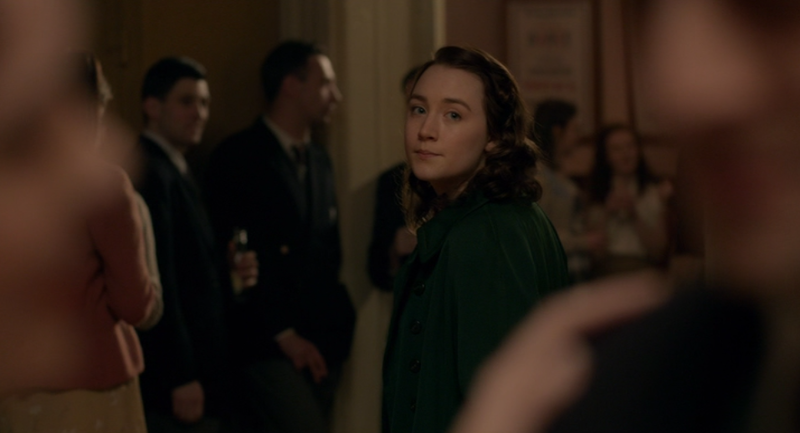 And then Eilis appears in the back of the frame, between them, one last fare-thee-well look toward her best friend, happy for their moment. But in terms of the movie, this moment still belongs to Eilis, which Crowley reminds us by jump cutting much closer to Eilis, rendering Nancy and George as blurs on either edge of the frame. 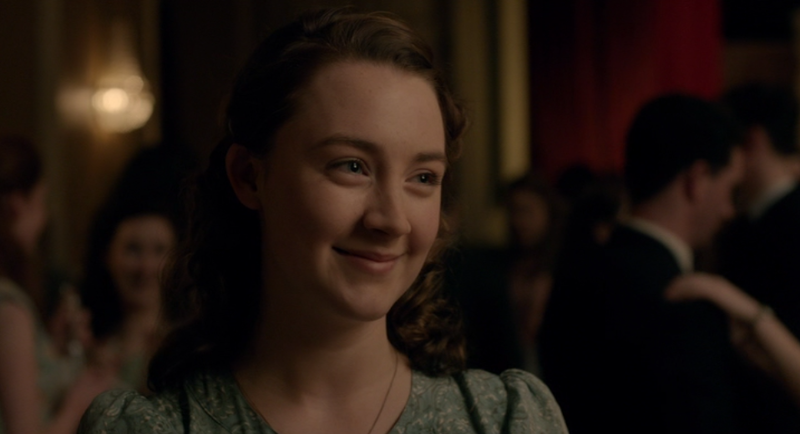 And then Eilis is gone, out the door, bound for America.